I have been playing the fitness game for most of my adult life... as a child, I was a chubby bookworm, who would always opt for a book or a game or a puzzle rather than playing outside running or playing sports. I loved to do crafts, and paint, and I spent lots of happy time alone with those activities. But as I got older and opened my social circle, I was attracted to very active, very adventurous people and I wanted to tag along with them on their fun and exciting activities. It started with outdoor activities such as hiking and backpacking in the Rocky Mountains, downhill and cross country skiing, and even running. But eventually I started working out to enhance my abilities in those activities. Soon exercise and fitness became part of my daily routine, and now I wouldn't have it any other way. 1. Exercises gives me a feeling of empowerment and confidence. I have learned that bearing down and pushing through a workout or a run when I don't really want to, or don't really feel like it makes me feel stronger both mentally and physically. I have learned that I am more capable of challenging physical activities than I ever thought possible. Hiking narrow, slippery, gravel trails in the mountains and also sailing in less than perfect conditions are mentally difficult for me, and the feeling of accomplishment these things have given me affords me mental strength to draw upon when I am faced with new and scary situations. 2. Exercise gives me balance. I still have a tendency to withdraw, be introverted, put my nose in a book or in my laptop, and spend idle hours in mental workouts. I know that being physically active helps me be more well-rounded, more social, and more outgoing. 3. Exercise gives me a mental lift when I am feeling a bit down. There is nothing like the endorphin rush from a sweaty, hard, outdoor run to put a smile on my face. If I am cranky or unsettled for any reason, putting on my running shoes and heading outside gives me a chance to sort it out and I always come back feeling better. Getting sweaty offers me great mental release. 4. Exercise gives me the opportunity to learn more about myself. I love paying attention to the way my body reacts to various movements. I learn where I am weakest, less flexible, and also how my body functions. I have learned that I cannot out-work a lousy diet. It's all good information. 5. Exercise has taught me patience. This is a big one for me as I was born a bit deficient in this area. I like to say my older Sister got all the patience and there was none left for me. But training for a half marathon taught me to add mileage and distance s-l-o-w-l-y to my routine so that I didn't get hurt. Weight lifting has taught me that building muscle takes time and effort. Nothing happens overnight. I have learned not to give up, but to perservere, with patience and sometimes even grace! 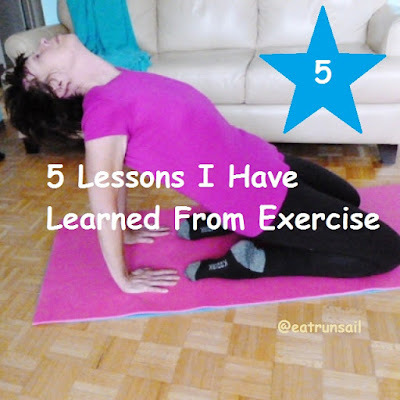 What lessons have you learned from exercise? I absolutely love the feeling of confidence that exercise gives me, more specifically, crossing the finish line at races. It always feels great to put your mind to something that you thought might not be possible, just to show yourself that you're able to succeed. Great list, very similar to mine! I love seeing how other people have been impacted by exercise. I love the comment on patience. I'm so not a patient person, but I can be (sometimes) when it comes to exercise. Yes, to all of these, especially the mental lift. Exercise is my anti-depressant. I'm so with you: exercise is such a gift. A celebration of all our body is able to do. With running especially, patience is definitely a virtue! I have very little patience even with exercise in my life, I can only imagine how much patience I would have if I didn't work out! BAHA H! All of those things but for me most important is confidence. I was lacking for most of my life. Running has been good to me. It has taught me that I am stronger than I give myself credit for! And all those reasons are exactly why I exercise. It's so good for our whole body, mind and soul. Sometime I forget how strong I really am - exercise really helps remind myself of that! Yes, I can say about he same for me! I really didn't know how far I could push myself, but now I know I can be pretty tough! It definitely gives me a mental lift too! I can relate to each of those benefits. But the one that stands out for me the most is "Exercise gives me a mental lift when I am feeling a bit down". Great post.